We’d love your help. Let us know what’s wrong with this preview of Clifford by Gail Herman. To ask other readers questions about Clifford, please sign up. I really just prefer the original Clifford books by Norman Bridwell. The TV show is okay, but the books based on the TV show are a step worse. In this installment of Clifford the Big Red Dog, Emily Elizabeth, Clifford and friends go see a movie on Halloween, and after the viewing, Clifford manages to make the white screen fall on him, making every one believe he is the Ghost Dog of Birdwell Island! What I most love about the book series Clifford, The Big Red Dog books are that through clear graphics, a compelling narrative that is easy to follow and enjoyable characters, the authors always introduce a moral. 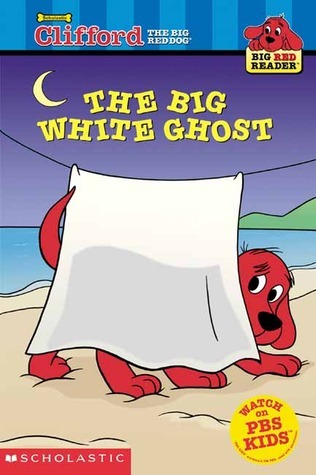 In the case of ''Clifford: In this installment of Clifford the Big Red Dog, Emily Elizabeth, Clifford and friends go see a movie on Halloween, and after the viewing, Clifford manages to make the white screen fall on him, making every one believe he is the Ghost Dog of Birdwell Island! What I most love about the book series Clifford, The Big Red Dog books are that through clear graphics, a compelling narrative that is easy to follow and enjoyable characters, the authors always introduce a moral. In the case of ''Clifford: The Big White Ghost'' it would be, just like Emily Elizabeth says that ''Every one get scared sometimes. Even brave dogs like Mac and Clifford'', meaning that it's alright to admit from time to time to having fears because it makes us human. It’s Halloween and Clifford and his friends are watching a scary movie at the beach. Clifford is scared and one of his friends acts tough and says that he’s not scared of anything. When Clifford goes to look at the movie screen he gets caught in the screen and looks like a big white ghost. Clifford’s friend who said he wasn’t afraid ends up getting scared and ends up learning that everyone gets scared. This book could be used if we are doing a unit on Halloween. I could read this to the students It’s Halloween and Clifford and his friends are watching a scary movie at the beach. Clifford is scared and one of his friends acts tough and says that he’s not scared of anything. When Clifford goes to look at the movie screen he gets caught in the screen and looks like a big white ghost. Clifford’s friend who said he wasn’t afraid ends up getting scared and ends up learning that everyone gets scared. This book could be used if we are doing a unit on Halloween. I could read this to the students and then have them write a story on what they would do if they saw Clifford the Big White Ghost coming toward them. This story, adapted from the successful Clifford PBS television series, does a nice job of bringing out the fun and personalities of the television characters in a necessarily short amount of text. The Halloween story is both safe and enjoyable. Clifford and his friend went to the movies and they watched a very spooky movie. It was really good at the end. L.
This was a a funny and engaging 'scary' adventure for Clifford. It is a safe read for kids who want a little fun and a boo. Kid's Review: "Oh no! A ghost! Clifford is scared!" Got it from the library and had to renew it twice. Creative storyteller and arts consultant Dr. Gail N. Herman has performed and taught storytelling extensively throughout the United States, as well as in Estonia, Latvia, Lithuania, Jamaica, Germany, Ghana, India, and the Virgin Islands. Besides performing for students in schools and libraries, Dr. Herman works with teachers and helping professionals to infuse storytelling and the kinesthetic, mus Creative storyteller and arts consultant Dr. Gail N. Herman has performed and taught storytelling extensively throughout the United States, as well as in Estonia, Latvia, Lithuania, Jamaica, Germany, Ghana, India, and the Virgin Islands. Besides performing for students in schools and libraries, Dr. Herman works with teachers and helping professionals to infuse storytelling and the kinesthetic, musical, and spatial aspects of learning into reading and other curriculum areas of our schools. She teaches for Lesley University, MA, Garrett College, MD, and The University of Connecticut (CONFRATUTE) in CT. Gail has directed the Tall Tale Liar’s Festival in MD for 16 years. Dr. Herman has conducted hundreds of in-service storytelling workshops. She also teaches art appreciation through stories, sound, and gesture as a guest in classes at George Mason University and Maryland Institute, College of Art and at the University of Connecticut. She presents many storytelling workshops and keynotes to state educational and other organizations such as LANES, NSN, Confratute, NAEYC, NAGC, and AEGUS. She was an invited keynoter at St. Thomas, Virgin Islands, and the New Ways Of Learning: Spotlight on the Multiple Intelligences Conference sponsored by Zephyr Press in Tucson, AZ. She performed at the Albert Schweitzer Symposium at the United Nations in NYC, at the Chautauqua Institute in Chautauqua, NY, the WV Storytelling Festival, the Harvest Moon Festival in WV, and the Northeast Storytelling Festival in Historic Gettysburg. Dr. Herman worked as a consultant with Dr. Patricia Hollingsworth on four education grants to train teachers to work with economically disadvantaged students with high potential at the University school in Tulsa. Her job was to infuse the kinesthetic arts and storytelling into the curriculum. Dr. Herman also worked as an enrichment consultant and storyteller in Cherry Creek Schools and Littleton Schools near Denver, Colorado. She works with Drs. Joseph Renzulli and Sally Reis at the University of Connecticut for the institute/conference called CONFRATUTE, where she teaches storytelling and movement applications to the classroom as well as Primary Grade Enrichment (with Dr. Susan Baum).